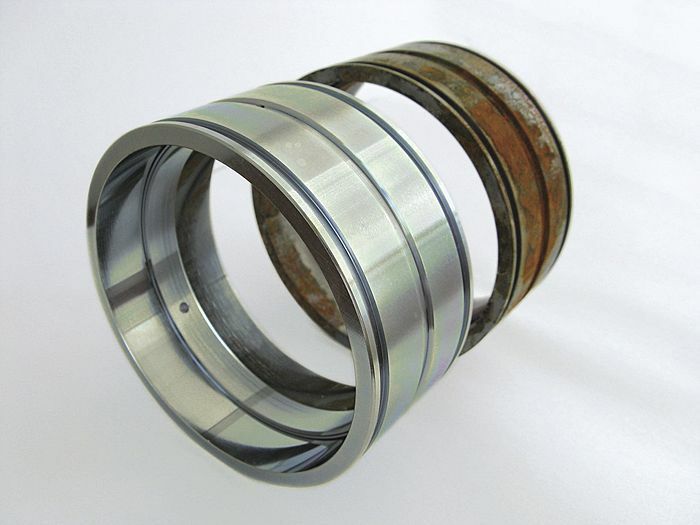 For bearings and metal parts that are exposed directly to humid or corrosive environments, NKE AUSTRIA GmbH offers a special galvanic coating that provides cost effective protection against corrosion. The new and improved coating SQ171E is even thinner and provides longer-lasting protection against corrosion than the previous version. The coating protects bearings and components in applications including material handling, agricultural machinery, chemical and pharmaceutical industries as well as compressors and pumps. The SQ171E coating can be used for standard or special bearings as well as for all metal parts that are exposed to wet or corrosive environments. Even machined surfaces such as races can be coated with SQ171E. The coating provides protection against water, condensation and slightly alkaline or acidic cleaning agents. Compared to uncoated components, parts coated with SQ171E have a significantly longer service life. As an additional option for even more effective protection the coating is also available with a silicate-based sealing layer. Due to the reduced thickness of the coating (from 2 to 4 µm) coated and uncoated parts are completely interchangeable. In accordance with DIN 58979:2008, the coating, at a thickness of 4 µm, reaches service life of at least 96 hours without coating corrosion (white rust) or base material corrosion (red rust). The SQ171E coating has been tested with the neutral salt spray test method in accordance with DIN EN ISO 9227 NSS. The passivation does not contain hexavalent chrome Cr (VI) and is therefore compliant with the RoHS directive. Compared to stainless steel, the SQ171E coating is more cost-effective, yet offers better anti-corrosion protection. NKE produces standard and special bearings for all industrial applications. Besides product development and application engineering NKE provides a full range of technical services and training. NKE’s products are distributed through 18 international representative offices and more than 240 distribution outlets in 60 countries.